I’ve not done a post on work wear, but I wanted to share this bargain with you! 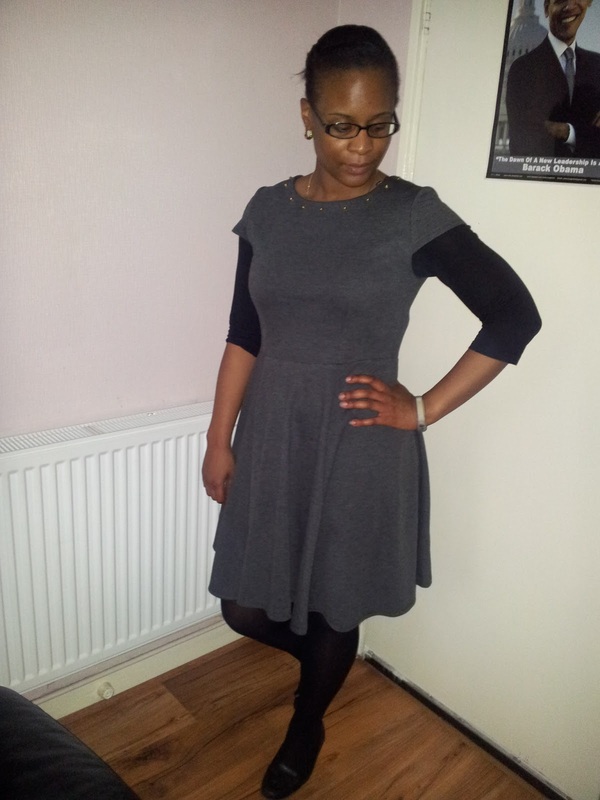 I bought this Studded Ponte Fit and Flare Dress from Asda about 2 weeks ago. I’ve been looking for new work clothes and over the last year or so I have been wearing skirts and dresses more often. I used to wear trousers almost all the time, but I think working in a predominately male environment has brought out my feminine side………weird. Anyway, I was browsing on the internet when I saw the dress. I liked that it was smart casual, and that the studs gave it a bit of an edge. The dress was originally £16 and I was happy to pay this price; however I put in it the basket and forgot to purchase it. A couple of days later, the dress was still in my basket but had dropped in price to £8!!!!! I quickly finalised the purchase and wanted to buy the burgundy version, but it has already sold out. Having worn the dress a couple of times, I’m pleased with the quality of the material especially as it was from Asda, known to be cheap and cheerful. It’s quite sturdy and I think that it works in favour with my body shape. 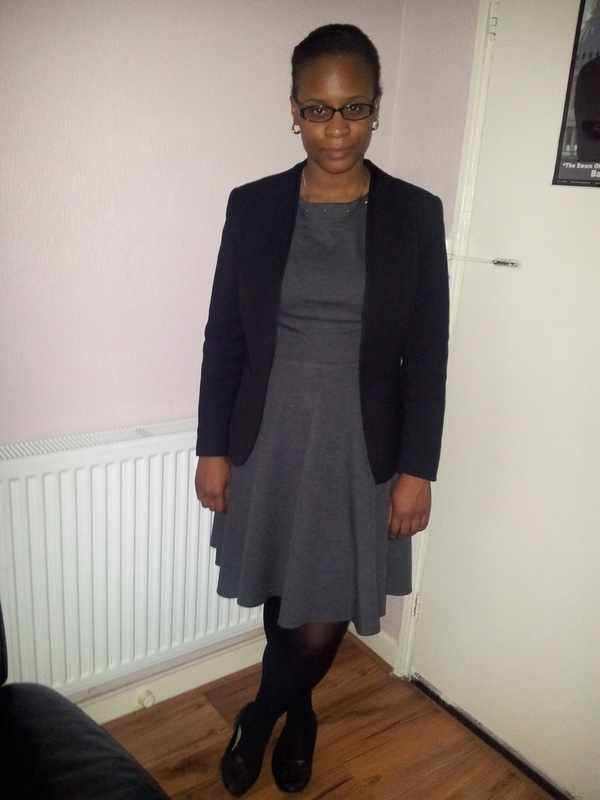 The dress can be made more formal with a blazer (as above) or dressed down with a cardigan. This was my first clothes purchase from Asda......I think I may checking their George range more often! 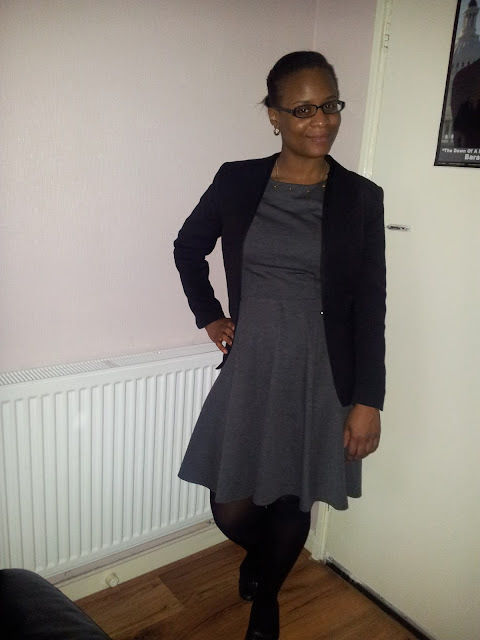 When the fit & flare trend popped up a couple of years back, I was still in trousers mode so didn’t think to purchases such dresses…..but this is now my second fit& flare dress; how times have changed!. Hoping to buy one more……. wow you look incredibly chic! this dress looks really good on you, it fits perfectly. also love the colors black & grey together. hello Chi-chi, I trust you are doing great? dress looks very good on yah! That is such a cute dress. So appropriate for work! hello i'm new in blogger !!! nice outfit! really like your dress! I really like your style, just found your blog. Now following and looking forward to more posts! !